Were the Supreme Court to rule that the minimum coverage requirement is constitutional, there would be no need for it to address the third question about which it heard arguments – whether the requirement is “severable” (i.e., can be severed, or separated, from the rest of the ACA). If it finds the mandate unconstitutional, however, it must grapple with the severability issue, since the ACA itself offers no direction about whether Congress anticipated that the remainder of the law would remain in effect if the mandate were invalidated. If it reaches the question of severability, the Court has three general responses at its disposal; these options were debated to varying degrees at oral argument. The first option is to simply sever the minimum coverage requirement, leaving the rest of the ACA intact. This perhaps is the option most consistent with Supreme Court precedent because, for statutes without a specific severability provision, the presumption has been in favor of striking down only the unlawful section of the statute (an unconstitutional provision may be severed from other constitutional parts of a statute unless it is “evident that [Congress] would not have enacted those provisions which are within its power independently” of the unconstitutional provision). Furthermore, given that the great bulk of the ACA has little to do with private insurance regulation and that many ACA provisions have already gone into effect, this option carries both legal and practical weight in its favor. A second option at the Court’s disposal is to sever the coverage requirement along with other provisions that are intertwined with the coverage requirement. The two sections most often debated in this context – and the ones the Obama Administration advocated for in the event the coverage requirement is found unconstitutional – are the “guaranteed issue” provision (which requires private insurers to sell to all-comers, regardless of individuals’ past or current health status) and the “community rating” provision (requiring insurers to set mainly uniform premiums, though some factors – such as age – could continue to be factored into rate-setting). The reason these provisions are most often mentioned as possible severability targets is because they amount to the insurance requirement’s quid pro quo: if under the ACA most everyone must carry health insurance, it must be made easier for people who historically have been shut out of the private insurance market (say, based on disability) to gain access to coverage, and if the insurance industry is now being paid premiums by tens of millions of people who historically were not paying premiums, they must not target relatively high-risk consumers with higher premiums. Thus, the argument goes, if one side of the deal (the mandate) collapses, the other side (guaranteed issue and community rating) must, too. A third option before the Court (and the one Justice Scalia seemed most in favor of) is to not sever the minimum coverage requirement at all – but instead invalidate the entire ACA along with the coverage requirement. Although this could easily be described as the most “activist” position, and while the coverage requirement is hardly essential to the rest of the ACA as a whole, this approach has a lot of traction with certain segments of the general public and many states. 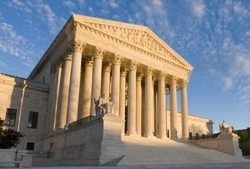 Furthermore, there is a consequence to striking down the entire ACA that may be attractive to certain members of the Court: by invalidating the whole statute on severability grounds, it obviates their need to decide whether the ACA’s requirement that states expand Medicaid eligibility or risk losing federal funds is unconstitutionally coercive. This topic will be discussed in the next blog post.